Zym.tollbahsuburban.com is the PUP that uses misleading techniques to prevent removal. Use Reimage to locate malicious components and get rid of them faster than with uninstall instructions. A full system scan blocks virus reappearance and prevents traffic to malicious domains. How can Zym.tollbahsuburban.com hijack my computer? How to remove Zym.tollbahsuburban.com ads? If your are suffering from Zym.tollbahsuburban.com ads, it's a sign that questionable browser add-on (Speed Checker) has infiltrated your computer. Beware that these ads may annoy you to death because they may start reappearing every time you start your browsing. In most of the cases, such potentially unwanted applications as Zym.tollbahsuburban.com virus travel bundled with various freewares and sharewares, and are labeled as adwares. When having such program on the system, you may expect unwanted redirects and advertisements on each of your web browsers, including Google Chrome, Mozilla Firefox and Internet Explorer. Fortunately, you can remove this application from your system quite easily and we highly recommend doing so because leaving this program on the system may lead you to various unpleasant activities that can not only affect your browsing experience but may also pose harm to your computer's security. You may put your computer at risk of malware because Zym.tollbahsuburban.com may redirect you to dangerous websites that may be infected by cyber criminals. This won't necessarily happen, but there is a chance that it might happen. Beware that in most of the cases these ads report about missing updates and actively offer downloading them for free. 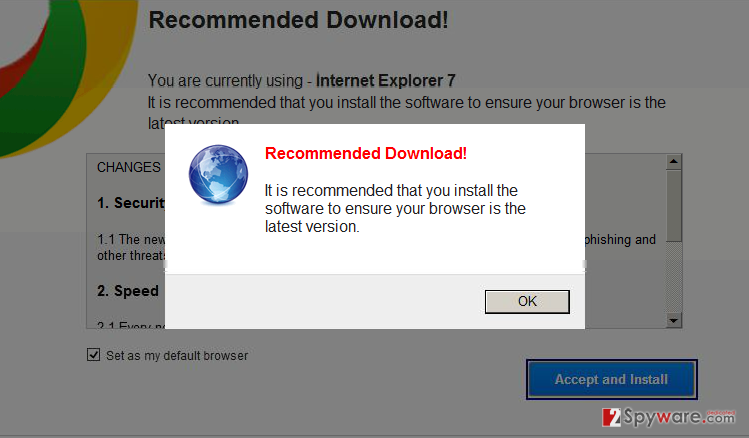 However, this can easily trick you into downloading other adware-type program. Besides, this program may monitor your browsing activities and share gathered data with other third parties that seek to drive visitors' traffic to their own websites. If this data would reach hackers' hands, you could expect tons of spam and other inconveniences. Typically, adware that causes Zym.tollbahsuburban.com ads can be installed on target computer along with various freewares. Usually, it is bundled with questionable programs and spread via poor reputation websites. If you have recently downloaded any kind of free program and failed to monitor its installation process, it is not surprising that Zym.tollbahsuburban.com virus is disturbing you. As soon as it infiltrates the system, it starts generating its fake advertisements and popup alerts that typically state that you need to update or install a piece of software (Java, Flash Player, PDF creator or similar). If you click on any of such offers, you’ll agree to download another suspicious program, such as Sweet-Page, Delta Search, WebCake, or CouponBuddy. Therefore, if you want to avoid them, never click on fake alerts offering you to update something for free. If you really need to update your software, find it on its official site instead. If you want to prevent installation of potentially unwanted programs, you have to be very careful during freeware's installation. Never skip notifications about 'optional downloads' and never click the 'next' button without reading all information about your program. Beware that Quick or Recommended installation mode will automatically install these adwares. Therefore, choose Advanced or Custom installation mode, which expands the process and discloses all the check boxes. If you have already noticed Zym.tollbahsuburban.com ads on each of your web browsers, follow instructions that are provided below and remove it immediately. In order to remove Zym.tollbahsuburban.com virus successfully, follow the instructions below and perform every step in a right order. Here, look for Zym.tollbahsuburban.com or any other recently installed suspicious programs. Wait until you see Applications folder and look for Zym.tollbahsuburban.com or any other suspicious programs on it. Now right click on every of such entries and select Move to Trash. When in the new window, check Delete personal settings and select Reset again to complete Zym.tollbahsuburban.com removal. Once these steps are finished, Zym.tollbahsuburban.com should be removed from your Microsoft Edge browser. Here, select Zym.tollbahsuburban.com and other questionable plugins. Click Remove to delete these entries. Now you will see Reset Firefox to its default state message with Reset Firefox button. Click this button for several times and complete Zym.tollbahsuburban.com removal. Here, select Zym.tollbahsuburban.com and other malicious plugins and select trash icon to delete these entries. Click Reset to confirm this action and complete Zym.tollbahsuburban.com removal. Here, select Extensions and look for Zym.tollbahsuburban.com or other suspicious entries. Click on the Uninstall button to get rid each of them. Now you will see a detailed dialog window filled with reset options. All of those options are usually checked, but you can specify which of them you want to reset. Click the Reset button to complete Zym.tollbahsuburban.com removal process. This entry was posted on 2014-09-25 at 08:01 and is filed under Adware, Viruses. You can quickly scan the QR code with your mobile device and have Zym.tollbahsuburban.com ads manual removal instructions right in your pocket. How did you remove Zym.tollbahsuburban.com ads?